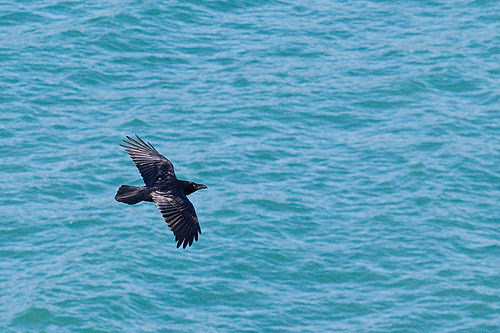 The raven is the largest all black bird , a member of the crow family. Huge size as large as a buzzard / large bill, and long wings. In flight, it shows a diamond-shaped tail / Performs remarkable acrobatics during its displays including the impressive feat of rolling over so that for a short time it actually flies upside-down / nests on a rock ledge / one of the earliest birds to nest / weight 1.3kg / length 64cm / 4-6 eggs / incubation 21 days / fledge 40 days / 1 brood .